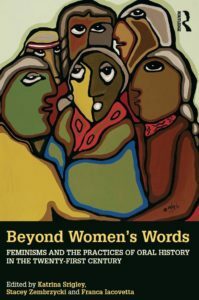 OHR Guest Editors Katrina Srigley and Stacey Zembrzycki reflect on the origins of their new book, Beyond Women’s Words, and a special section of the OHR they co-edited, both of which are rooted in feminist oral history practices. The post also previews upcoming sessions at the Oral History Association’s annual meeting related to this work. *This is the first of a two-part post that will offer reflections on the Winter/Spring 2018 Oral History Review special section on feminist oral history. When we began to think seriously about issuing a call for papers for a collection on feminist oral history in 2014, we had no idea how big the project would become or how incredible the response would be from feminist oral historians around the globe. In May 2014, we helped to co-organize a roundtable discussion about the now twenty-six-year-old classic feminist oral history text, Women’s Words: The Feminist Practice of Oral History, for the Berkshire Conference on the History of Women, held for the first time outside the United States in Toronto, Canada, under the direction of Franca Iacovetta. Despite an early morning timeslot, more than one hundred people squeezed into a classroom better suited for thirty to both reflect on the book’s early insights and center the histories of women and other marginalized people in discussions of the past. The session also raised difficult questions about feminist oral history that we felt required further consideration, hence our decision to pursue these important conversations in print. Like the Big Berks roundtable, the recent publication of a special section of the Oral History Review (Winter/Spring 2018) and a 25 chapter volume entitled Beyond Women’s Words: Feminisms and the Practices of Oral History in the Twenty-First Century (Routledge, 2018) are rooted in Women’s Words and our own feminist oral history practices. When we developed the oral history projects that led to our first books—Breadwinning Daughters (University of Toronto Press, 2010) and According to Baba (University of British Columbia Press, 2014)—we did so from within the discipline of history, where questions about objectivity and the validity of memories as historical sources still had significant traction. Discovering feminist oral history through a book like Women’s Words was intellectually liberating: the authors offered a variety of meaningful starting points for redirecting our approach to oral history. Deeply engaged in the practices of oral history and attuned to the rewards and pitfalls of carrying them out, they tackled head on critical questions regarding self-reflexivity, authorial power, and the challenges inherent in presuming a collaborative process between ourselves and our narrators. Our research careers expanded our engagement with questions at the heart of feminisms and oral histories and brought us to that conference room on that spring day. 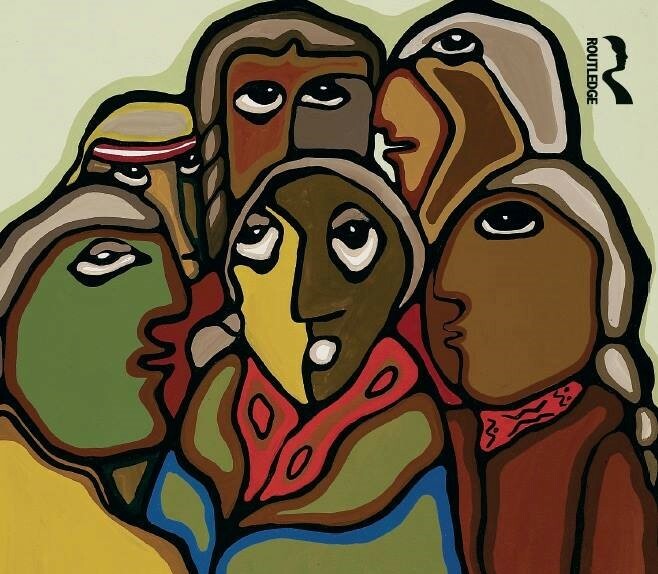 Beyond Women’s Words: Feminisms and the Practices of Oral History in the Twenty-First Century Cover art: Daphne Odjig, Aunt Grace and the Elders (1978). Our subsequent call for papers asked contributors to consider a number of pressing concerns, including: how do unequal relations, in all of their iterations, affect the ways we collaborate with our subjects? Does building relationships with marginalized narrators enable us to write egalitarian scholarship? Is feminist oral history a form of political and social engagement that necessitates advocacy and activism or detachment? We wanted to consider whether and how feminists and others have moved beyond women’s words and what, exactly, feminist oral history looked like in the twenty-first century. Having received more than sixty proposals to our CFP, we knew that an edited collection of essays as well as a dedicated section in an issue of the leading journal in the field offered a perfect way of sharing the dynamic work being done by a wide range of feminist oral historians—be they artists, community activists, or scholars—from around the world. In addition to publishing Beyond Women’s Words with Franca Iacovetta, in May 2018, we produced a special section of the Oral History Review (Winter/Spring 2018) dedicated to feminist oral history. The articles by Katrina Srigley and Lorraine Sutherland, Ioana Radu, Margaretta Jolly, Li Huibo and translator Ding Zhangang, and Jennifer Brier seek to decolonize and decenter the field of feminist oral history. To decolonize is to engage in oral history practices and produce scholarship that challenges ongoing and historic forms of colonialism. Decentering supports decolonization by forcing us to reflect critically on the centers and edges of our field in the spirit of anti-colonial thinkers like Lila Abu-Lughod, Chandra Mohanty, and Linda Tuhiwai Smith, who have long researched, written about, and talked back to global imperialism in all its forms. In challenging the field’s centers and edges, the contributors in this special section do not only accept the messy and intellectually rigorous reality of this demanding and complex scholarship. They also highlight the varied ways that it is responsive to the key epistemological, ontological, and methodological challenges involved. Moreover, they demonstrate the different ways in which this work is built on and sustained through diverse and complex relationships. This published cluster addresses the long-established storytelling and story listening theories and practices of Ininiw and Anishinaabeg people, and how equitable research partnerships on Eeyou Istchee, the ancestral territory of the Cree Nation in eastern James Bay, provide critical insights into health and healing. From oral historians in China, the UK, and the US, we learn about efforts to decenter patriarchal national narratives in China, and about collaborations that make space for women—predominantly those of color—living with HIV/AIDS by centering and decolonizing their voices, experiences, and stories. This is not easy work, as we will discuss in an extended recorded interview with contributors that will be published in the second part of this blog. Accepting, working, and thriving with this sort of dynamism is challenging at the best of times but is ultimately central to change and growth in the field. If you are coming to the annual meeting of the Oral History Association, in Montreal, Canada, between October 10 and 14, and are interested in this conversation, please consider coming to one of these sessions. A number of them will be showcased in the conference’s public stream and so they are free to attend! In addition to these sessions, we are also hosting a launch for Beyond Women’s Words and the special section on feminist oral history published in Oral History Review. Please join us on Friday October 12th from 5:00–8:00 PM at the Atwater Library (1200 Atwater Avenue, Westmount, QC, Canada, H3Z 1X4, Atwater Metro Station). The reception will be followed by a performance of Come Wash with Us: Seeking Home in Story by the Tasht Collective. Books will be available for purchase from Librairie Paragraphe Bookstore. We gratefully acknowledge the support of the Oral History Association’s program committee, as well as funding from Concordia University, the Centre for Oral History and Digital Storytelling, Nipissing University, and the University of Toronto, without which this event would not be possible. Please RSVP here. Katrina Srigley is an associate professor of history at Nipissing University in Ontario, Canada. Her research interests are in Anishinaabe histories and ways of knowing, with a focus on women’s and gender history, and oral history. Dr. Srigley works in partnership with Nipissing First Nation to examine the history of Nbisiing Anishinaabeg through Anishinaabe ways of knowing, recording, and sharing the past. Stacey Zembrzycki teaches History at Dawson College in Montreal, Quebec. An award-winning oral and public historian of ethnic, immigrant, and refugee experience, she is the author of According to Baba: A Collaborative Oral History of Sudbury’s Ukrainian Community (UBC Press, 2014) and its accompanying website: www.sudburyukrainians.ca, and is co-editor of Oral History Off the Record: Toward an Ethnography of Practice (Palgrave Macmillan, 2013) and Beyond Women’s Words: Feminisms and the Practices of Oral History in the Twenty-First Century (Routledge, 2018). The authors gratefully acknowledge Odjig’s family for giving them permission to use Daphne Odjig’s Aunt Grace and the Elders as the book cover design.